Release Notes highlight the recent product updates so you can stay up-to-date on what’s new. An update to help you track and report on group employee info. Additionally, a few things to help make creating new records easier and more efficient. Learn more about the release below. If you work with groups in the health and life insurance industry, keeping track of employees and their information is a day in and day out activity. Having employment info easily available helps when it comes to working on renewals or simply looking up information when you need it. With this update, you can track and report on group employee info. You’ll be able to quickly add important employment details and see employment information at a glance. As you are adding individuals to a group, you can add details about their employment. Track an employee's classification, status, salary, hire date, and term date. Set up employment classes and statuses to match your agency. A few are included by default to get you started. When you have several employees to add at the same time, you can now do that in a more effective manner by saving and adding another. This lets you add multiple employees to a group easily and efficiently. Learn more about adding group employee info. 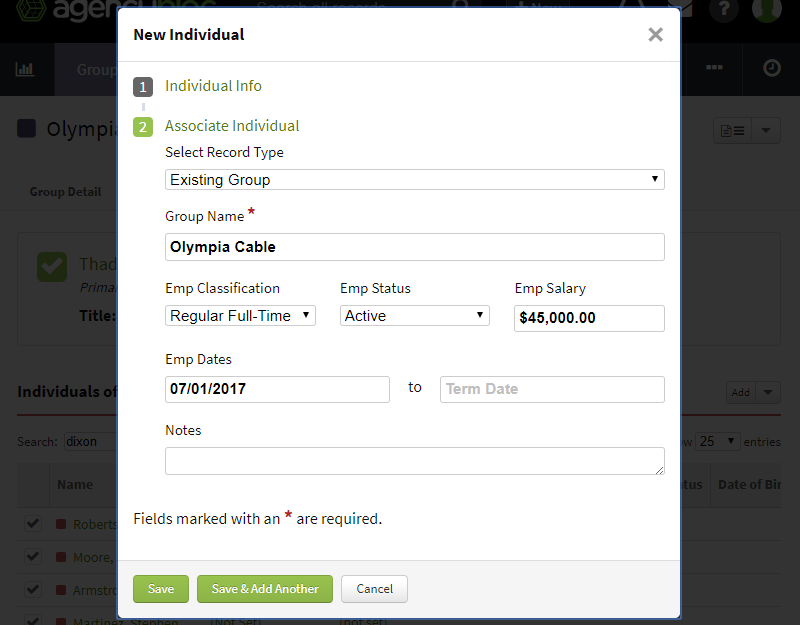 With this update, you can display individual employment information in the Group - Individuals tab to quickly see details. 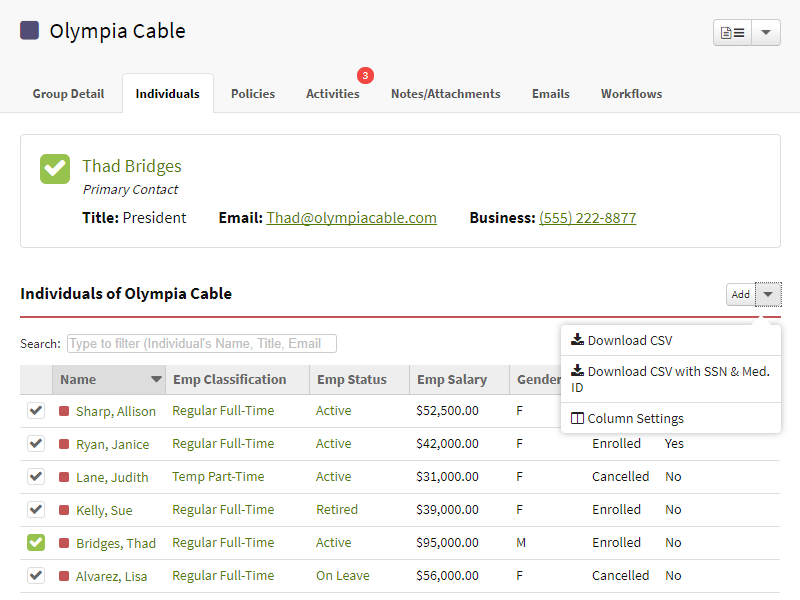 Customize your column settings to see employment info. Additionally, export data to get a list of the employees in a group with their employment data. You can also access this information in the Groups report. As you are viewing an individual associated with a group, you’ll see a summary of the employment details near the individual's name. To see more or edit details, click on the green pencil icon. Learn more about viewing group employee info. Adding and working with data may take more time than some of us would like. It may feel like you spend more time adding data than helping clients with their insurance questions. With the update, you can quickly enter new records one after another for groups, individuals, and policies. Enter a record and then select Save & Add Another to start creating another new record. This lets you create multiple records in a row without breaking a sweat. You can also do this when you need to add multiple individuals to a carrier or group. We're here to help. So, if you need anything just let us know by emailing us at help@agencybloc.com. Also, let us know what you think of the update. Have a good one!